While visiting the Swarovski Store at the Chicago Premium Outlet Mall this past weekend, I came across the most adorable memory stick! 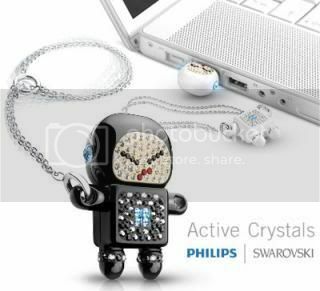 Toting 2 GB of memory, this little guy - blinged out in lovely Swarovski crystals - may possibly be the flashiest flash drive I've ever seen. "Naughty Raymond" is available at Swarovski Outlet Stores and Swarovski.com. P.S. You can also find "Happy Laura" (shown above in white) at Swarovski.com. She's just as darling. LOL! I love the way you are finding girly geek accessories. Keep it coming and my Christmas shopping for myself will be so easy! @Raijean, can I get one for myself first? lol. @Jessica, it really is a great gift item! @Sheena, it is definitely worth it. You have to see it in person to really appreciate its splendor. OH sh*t, I need this. Like now.